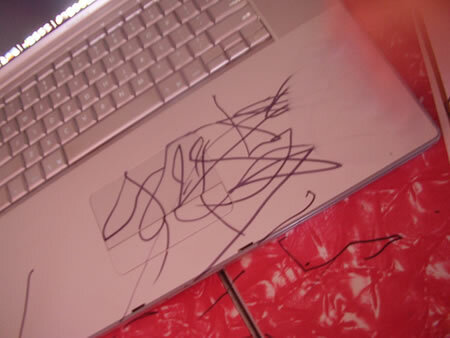 A toddler with a Sharpie marker can wreck havoc creating masterpieces across walls, doors and so on, but scribblings on your precious Powerbook. Aarrgh !. Surely the markings on the lappie will make you wanna scream or even give some spanking but then the cute face and innocent eyes will melt your heart and give you an excuse to buy a new Macbook Pro. REMEDY for this problem: Take a sugar cube and use it like an eraser on the marks. It will take time but will not scuff the surface bad, as sugar is strong but not that strong. Makes a better alternative to solvents and sandpaper. Try it out and post some results please. Use zippo fuel…tried & tested!